Our bi-weekly scrambles got skipped two weeks ago with Christmas around the corner, and was only 6 strong today for the same reason. That being said, the 6 of us included both my Wife and I, her appearance being her first tournament. She took Krueger2 and Kaya1, but ended up dropping Krueger both times (We didn't need 3 rounds to establish 1st place). She faced off against Terminus first round and was doing pretty well until she learned he could fly. Up to that point, she was pretty confident. Her second game was against a Thagrosh2 player that had just finished dropping Abby2 into me. She lost that one as well. She thinks she should have played Kaya1, for starters, but as we talked about it she realized she wasn't arcing TKs through the grove. At all. Ever. So she lost them both but was pretty comfortable with what all was happening and why she lost. My first game was into Legion, Abby2 as I said above. It was a triple Scythean list anchored by Typhon, plus the pot, 2x shepherds, 2x forsaken. Scenario was destruction and I won the rolloff to go first. I've been wanting to try D3 into Abby2, though this is a considerably different list than I'm used to with her. No Raeks or Carniveans. 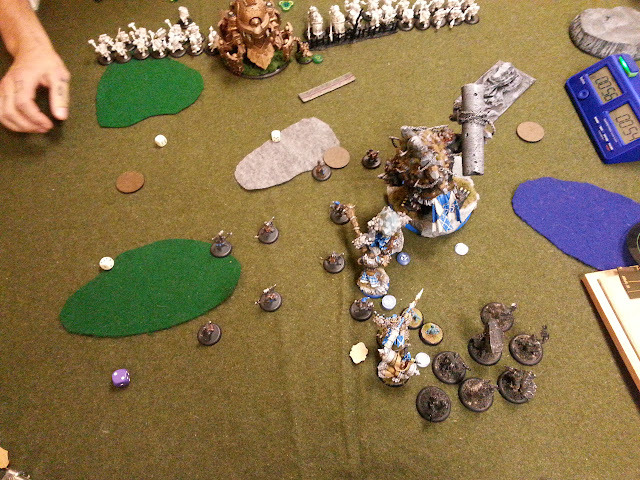 Turn 1 I was way up the board, near the zone, burrowers running because there was no ranged threat. He moved up very little with everything and fortified a beast. On the second turn, Doomshaper pushed in, feated. Burrowers burrowed. Mulg didn't do much. Axer rushed the King. The King assaulted the pot, killed it, and didn't have range on anything else. 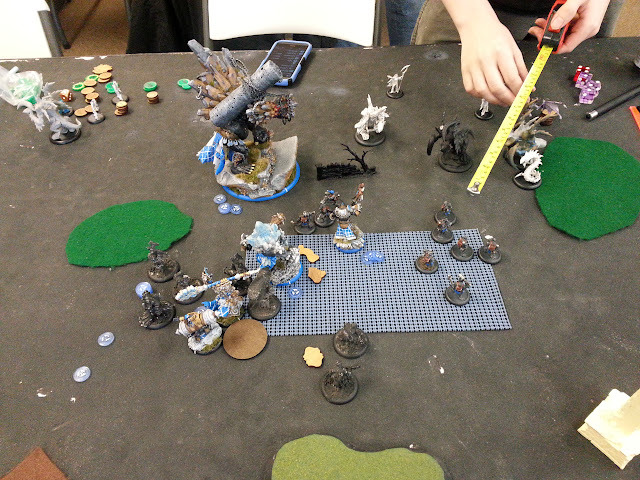 The spray clipped the Fortified scythean and did some damage but nothing major. On the next turn, everything just ran around. Most of her force ran to my right, and then one Scythean just moved dead center into the Mountain King and tried to block him as much as possible. Burrowers came up. Several surrounded the Scythean engaging Bruce, others came up near the objective. Doomshaper creeped around my objective, did Signs and Portents for warrior models, upkept Admonition and cast Implacability (which he had been nearly every turn). The burrowers remove the objective, and do some damage to the Carnivean though not nearly enough. The Axer fails to finish him as well. The King wanders around, still engaged. He sweeps and amucks, hits a Forsaken and the Scythean, kills the forsaken, hurts the Scythean. Boosts the killshot to hit on the other forsaken, oneshots a shredder, then finishes the Scythean, which is the picture below. Killing both Forsaken is pretty big because I really don't want them trivially removing burrowers. Mulg moves across to block a possible charge on Abby's feat turn. The stone is filtered in and around Doomshaper and trying to occupy the zone as much as possible. I score 3 CP. Abby goes. She gets Conferred Rage off of one of the burrowers, feats and runs away. Burrowers fail their terror check from her. A scythean goes in on the Axer and removes it, leaving a whelp or two. Typhon goes all in on the Mountain King and I go whelp crazy, spawning 2 for most of his attacks. There's a second Scythean that can get in there and get the King, but by the time I finish whelping, there's no place to land and the king survives with six or seven boxes at ARM21. The Naga moves in, hits some burrowers in the corner. The other Scythean just walks in and contests the zone as well, kills another burrower or two. They're all dead in that corner, and I have 3 beasts mostly healthy in the zone. On my turn, the King heals 21 boxes between the whelps and regen from D3. He moves in, amucks, headbutts, misses Typhon, and then buys, boosts and boosts damage. Calls it a turn. I was hoping for a killshot spray into the Scythean in the middle of the zone that killed my axer but no go. Burrower pass CMD but that's it. Doomshaper moves up, boosts a hit and crit smites the Scythean back, but not enough. He hits again, but only smites him out another half inch. Not enough. Scroll does free animi though. Mulg charges across the zone, hits the Scythean there. He damages, buys, hits, crits and moves him out of the zone. Kills the Naga with two more hits. Mulg buys an attack on the last Scythean in the zone, but can't finish him, so no dominating. Mulg does do Runebreaker though because of the scroll from D3. Typhon goes all in on Mt. King again. Same story. Can't finish it, lots of whelps when we're done. Abby goes all in on Mulg, using the tail to syphon his fury away, but this does 2 things because I choose not to admonition away. A) It gives me a transfer target because before, Doomshaper didn't have one, and he was two inches from a Scythean, and B) it manages to spawn a few whelps for Mulg. To recap, there's two Scytheans on either side of him. One nearly dead on the left near D3, one on the right mostly healthy. Both have a fury because they stood up. Abby tries to cast Psycho Surgery. She can't because of Runebreaker, meaning that she cannot Teleport either. She ends up camping five or six transfers. The left Scythean moves in on Mulg as PS17, and tries to get him, but at dice -4, can't finish it, and Mulg whelps enough to the right to block most of the other Scythean's lanes. When that Scythean does try to come over, Mulg admonitions away. On my turn, the Mt. King heals 19 boxes, amucks again, headbutts again, kills Typhon. Boosts a hit into the nearly dead Scythean and kills it. Mulg easily finishes the other, and that's game. 1. Mt. King healed 40 boxes. With 2 whelps per strike, it's really hard to get more than one model into the King when you have a low model count list, or no ranged attacks to clear them out. Mulg, with Implacability, Admonition and Whelps is also very difficult to reach. 2. Abby2 still concerns me. She can easily force me to feat defensively. I think she's one I normally want to go second against so that I can clear the zone bottom of 2, score 3CP, feat and clear it again bottom of 3. So of the six of us, obviously 3 won, but the third guy lost is second game very quickly leaving the winner to be decided amongst the 2 of us and we both had the CP for 2nd place as well. My opponent has played against both of my lists, (He was a Kromac2 player last time), and I played the list he would drop against me last week with Grim2. Grim2 got lucky when he beat it, and both of us wanted to know what Doomy3 would look like. 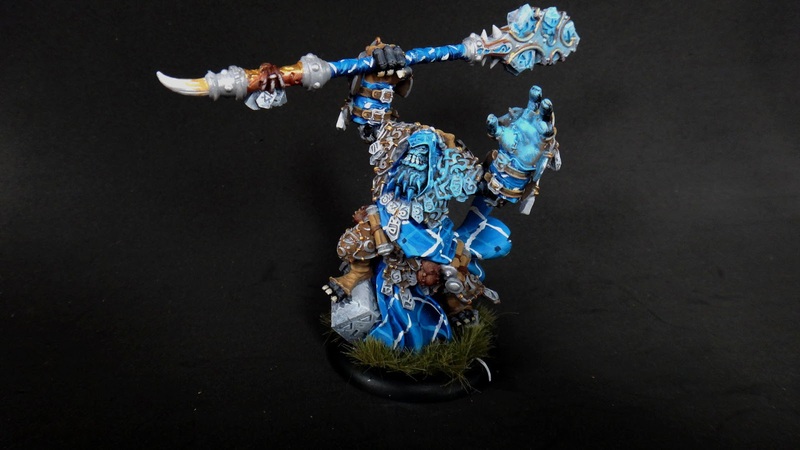 His list was Gorten, Earthbreaker, 3x TAC, 2x Forgeguard, 2x Bokurs, Thor and the dude with coins. Whatever his name is. I won the rolloff and chose first. I ended up way up the board, ran the burrowers even against the Earthbreaker. The Earthbreaker removed 3 of them, and Gorten put a Rockwall down. The picture above doesn't show it, but the Forgeguard all run, and the left unit clumps together into the woods. 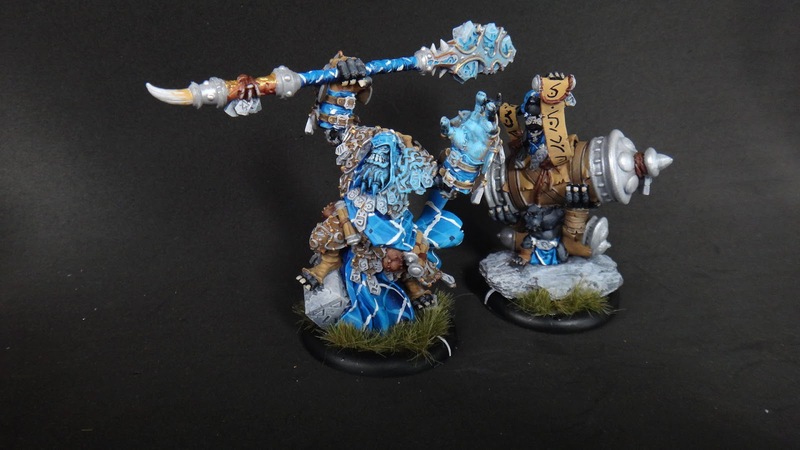 I really want to killshot them, and I think I can get the King in range of the Earthbreaker. I'm going to jam the King down his throat either way and feat on it, but I want all the above. I measure it several times, and I feel like I can charge the TAC he puts in front and engage two of them AND the Earthbreaker. The assault I know won't get many, but the Killshot will hit most of the Forgeguard, and after that I just buy attacks on the Colossal. What happens is that even with Rush, I only engage that one TAC, and only kill him with the assault, leaving me nobody to trigger killshot with, and I'm out of range of the Earthbreaker. My army does skew left though, burrowers burrow. My next mistake is that the Earthbreaker gets +4 from Gorten (who has to sneak out from Doomy's control area to do that because of the lamentation scroll), and then I forget to remind my opponent to only roll 2 dice and not 3 damage dice for the charge. He rolls a 6,6,5 for the charge damage, and then on the second roll I remember. It's too late though, and at that point we couldn't remember what he'd rolled anyways. He ends up leaving it on one box and the Bokur barely finishes him. Another Bokur moves up in front of Gorten, while all of the forgeguard are very careful to stay away from Mulg's threat range, the Bokur is just baaaarely in and I can goad from him. So I do. I boost the initial hit to be absolutely sure, kill him, then goad, buy another reach to another model. Kill that one, and then I realize that 1 for the charge, 1 for boost, 1 for goad, 1 for buy, I'm left with just one to goad into Gorten and no more to buy attacks with. We roll it out and if I had not boosted on the Bokur, I would have hit, killed, and then had two attacks on Gorten and killed him as well. The next turn goes as expected. Everything dies and the game peters out pretty badly from me thereon out. He wins with 3 CP to my 1, and kills Doomshaper. 1. I got too greedy on the assault. I could have even just charged, and not taken the ranged attack, but then killshotted the Forgeguard. That would have been better. 2. I've got to remember the dice on the feat. Overall, my opponent played it tight. There wasn't hardly anything I could look at and say he made a mistake whereas I made several. The games I land against that particular opponent are always interesting. 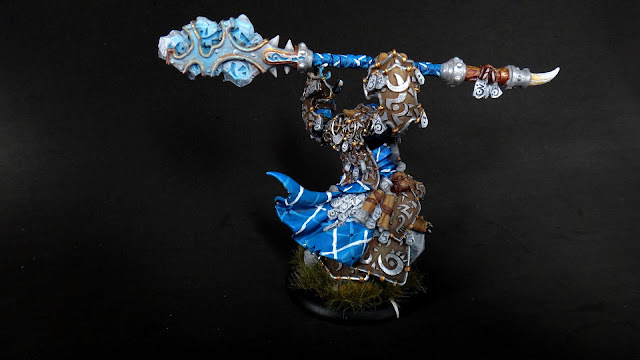 He loves his dark horse casters and is exceptionally good at making them work. Really enjoyed both games, and it's nice to be back in after the vacation and holiday. Hey, my wife's even on the tournament scene now. So, Merry Christmas, hopefully you guys have had a good holiday. My painting desk is absolutely full right now. 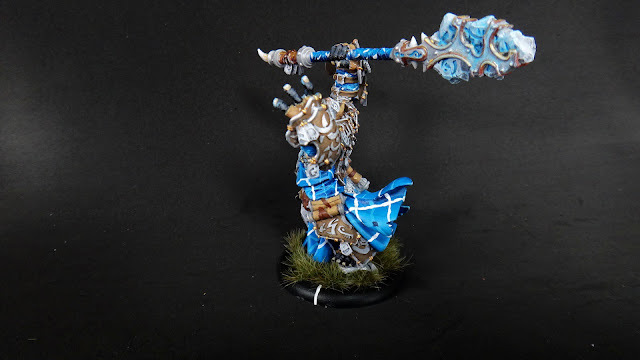 Kromacs 1a, 1b, 2, Nicia, Haley3, Ace, Glacier King, a Rok mod (even with the announced resculpt), a Knight Errant Seneschal... all kinds of things. Expect to see a lot of painting come off the works here before too long. Also, I didn't post doomshaper3, and he's right here. So, again, Merry Christmas, Happy New Years, and we'll see you again before too long. Truly an amazing model. Love you're painting.